Jurassic Park is a video game for the Super NES/Super Famicom based on the movie adaptation of the book by Michael Crichton. It was developed by Ocean Software and released in 1993, and 1994. The game is viewed from a top-down view for most of the game reminiscent of the Zelda games. When the player enters a building, the gameplay perspective shifts to a first person view. The game is significant for combining two different perspectives and a 3-D game for a fourth generation videogame console, and for being an early game mastered in surround sound (Dolby Pro Logic). In the game, the player controls Alan Grant, and the objective of the game is to complete certain tasks in order to escape, such as clearing a raptor nest of eggs, and turning the generator on in a utility shed, allowing for opening and closing of gates and the like. Communication ports set up around the island allow characters in the game to communicate advice to the player, though some advice is deliberately malicious. 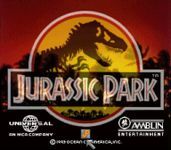 Jurassic Park supports the SNES Mouse when playing first-person sequences or operating computer terminals. The game's soundtrack consists of various music that corresponds to the area the player is currently exploring (except the two Tyranosaurus Rexes who have their own theme track). The game typically takes 2–3 hours to complete, though some objectives, such as collecting all 18 raptor eggs, can slow down a player's progress. The current world record for fastest completion, however, is one hour and nineteen minutes, held by Paul Inglehart. There is no way to save the game, however, there are an unlimited number of continues available. The player, therefore, is required to play through the entire game in a single sitting. Source: Wikipedia, "Jurassic Park (SNES game)", available under the CC-BY-SA License.